Chinese New Year is my kind of holiday—parading dragons, fireworks, and food (lots of food!). This year, Chinese New Year begins on February 16. Flashy pyrotechnic shows and boisterous parades scare off evil spirits and auspicious foods portend prosperity, longevity, health, and happiness for the coming “year of the dog.” It’s the most important holiday on the Chinese calendar—everything you do (and eat) that day, and in the days leading up to it, according to Chinese custom, determines how your entire year will play out. Any holiday that promises to deliver good fortune because I stuffed my face with dumplings, noodles, and other auspicious foods is carved in stone on my calendar, too. 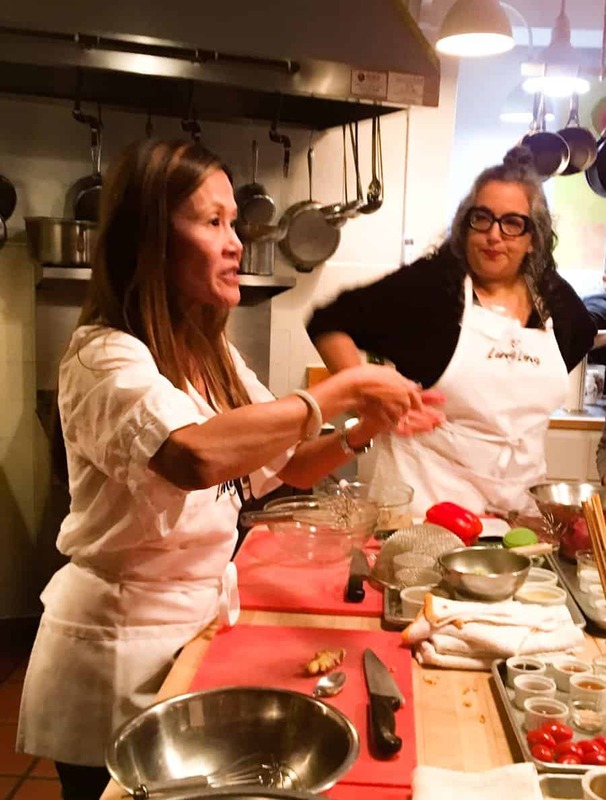 Earlier this week, at a San Francisco event hosted by Ling Ling Asian Kitchen, I got to hang out with some other local bloggers, cook and eat some delicious Chinese New Year foods, and learn about how to celebrate Chinese New Year from Chef Katie Chin. Chef Katie shared stories about growing up in the food business and co-hosting a cooking show with her mom, among other things, and we got to cook and eat a fantastic meal including Ling Ling Fried Rice in both the Yakitori and Chinese Vegetable varieties, which are a freezer staple in my house because they’re so easy to prepare and truly delicious. Most importantly, Chef Katie clued us in to which Chinese New Year foods will bring us a year full of good luck, good health, laughter, and wealth. I’m planning to celebrate Chinese New Year with my family by cooking up a menu loaded with luck-bringing foods. Shrimp, Chef Katie told us, will bring a year filled with laughter since the word for shrimp (har) sounds like laughter. I’m testing Szechuan-style spicy, garlicky shrimp recipes in anticipation of the big day. I’m hoping the year of the dog will be much funnier than the year of the rooster. Nuts and seeds represent fertility and “many sons,” so if you’re hoping to grow your family this year, the cucumber salad we made with Chef Katie was garnished with a healthy sprinkling of black sesame seeds. We also created tasty marinated and grilled veggie skewers, which make a festive and healthy side, as well. Long noodles mean a long life. Ling Ling makes this part of the menu easy with their traditional Asian-style noodle dishes infused with delicious sauces and studded with tender chicken and vegetables. We ate (well, devoured!) the Yakisoba Noodles and the Drunken Noodles. 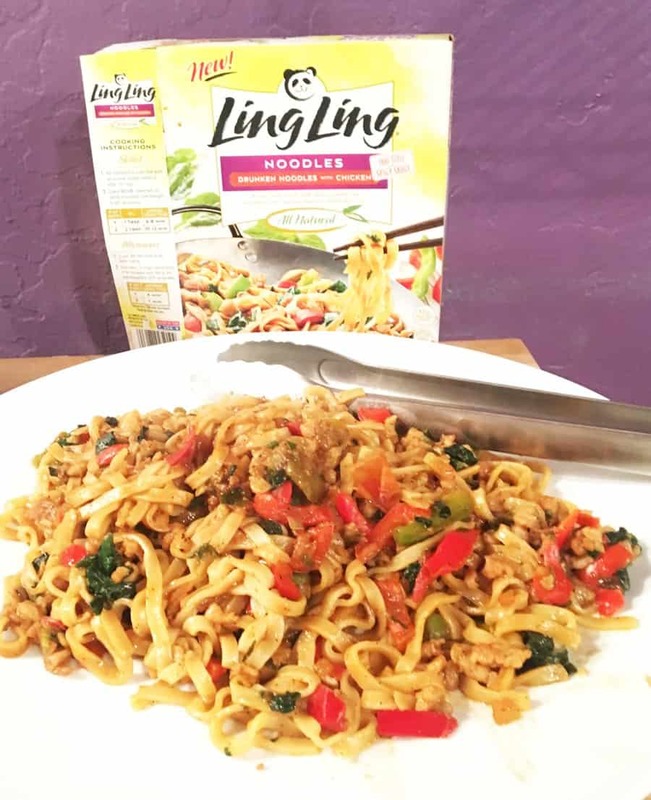 I don’t quite understand how Ling Ling nails the perfect noodle texture in a ready-made frozen dish, but they do. Both dishes were spot on, but the spicy kick of the drunken noodles made them my hands-down fave. I think the other bloggers agreed since this dish was gobbled up fast. Dumplings and spring rolls represent wealth. Potstickers, for instance, signify riches because they are shaped like gold ingots. Again, Ling Ling makes it easy to put this luck-bringing food on your new years’ table with their famous chicken and vegetable or pork and vegetable potstickers. 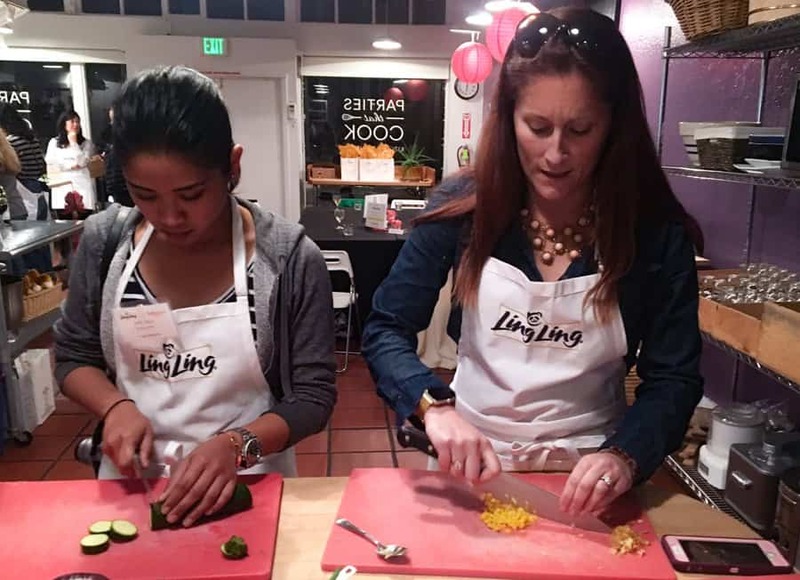 Ling Ling makes spring rolls, too! Chef Katie didn’t talk so much about dessert, but what kind of a celebration is it without something sweet, amiright? I’m planning a baked sticky rice cake with coconut milk and some of my own non-traditional twists. The sticky rice represents “family togetherness,” and who doesn’t want more of that? (Wait. You might want to think carefully before you answer that question.) I’ll be following up with some recipe posts over the next few weeks. Chef Katie also showed us some easy crafts to do with kids to celebrate the holiday. 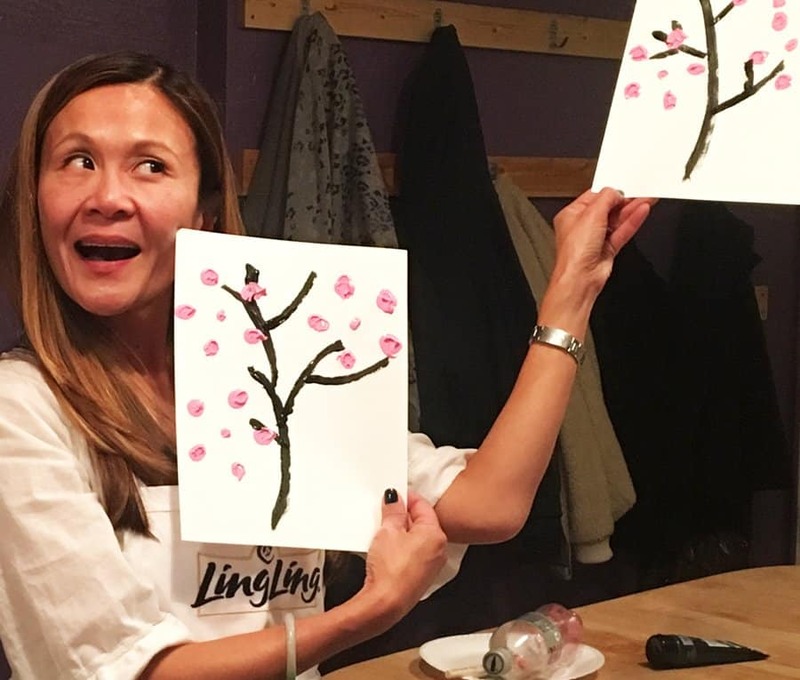 I loved this easy-to-paint cherry blossom. Katie used the bottom of an empty plastic soda bottle dipped in pink paint to make the flowers. Clever, huh? I loved this event and came away excited to celebrate Chinese New Year with my family. It is an honor to partner with Ling Ling (again!). I love their products—especially the potstickers, fried rice, and those amazing drunken noodles! Meeting Chef Katie and having the chance to cook and craft with her was a blast. And, of course, I always love a chance to get to know fellow local bloggers. Check here to find out where to buy Ling Ling products in your neighborhood.